This Friday, Sept 21, 2018 Velocicast will release a major upgrade after sales have concluded. This version release will contain many new features and enhancements. The purpose of this announcement is to make auction staff aware of new standard features and to educate on the upcoming enhancements available to enable upon request. Most of these changes affect block clerks: please make sure they read and understand this document. As always, if you have any questions about the new features please reach out to our support team at simulcast.support@auctionedge.com or call us at 1-800-522-8404. Thank you for choosing EDGE Simulcast and for being part of the EDGE family! The following list of enhancements have been added to enhance both the auctions’ and online users’ experience. They are not optional. Please take time to familiarize your employees with these new features. 1. Confirm Online Sales - Previously, auctions had the option to require clerks to confirm an online sale or offer (as seen in the image below) or to automatically sell the item without confirmation. Clerks will now be required to confirm all online sales. Also, the online bidder experience will be different. Before, when the Clerk clicked SOLD or OFFER, the online bidder would immediately see a ‘winning bidder’ message, now their bid button will disable and they will see a ‘finalizing…’ message until the clerk either finalizes the sale or backs it out. 2. Custom Bid Increment - A custom increment text box has been added to the clerk screen that can be used to change the bid increment to any numerical value as seen below. To change the increment, simply click on the ‘increment’ box, type in a number, and hit the enter key on your keyboard. 3. Set Default Bid Increment - A default bid increment box is now available in the individual clerk settings window. You can also set the default increment amount from the Velocicast Admin page. On the clerk screen, in the attendee list, an orange X will be visible next to each bidder’s name in the bidder list. If the clerk clicks the X then confirms ejection, the user will not be allowed to participate in any lanes for that given auction for the rest of the day. To reactivate ejected user go to the Velocicast admin website, find the ejected user in the Users tab. Click on the gear icon and select edit. Click on Activate to reactivate user. Confirm you want to activate the user. The user will now appear active and can immediately start using simulcast again at your auction. 5. Pause a sale - Simulcast now allows a clerk to ‘pause a sale’. Pausing a sale provides the online users with a message that describes the reason for pausing. Pause mode won’t be activated when clicking the ‘Stop Event’ button until at least one item in the sale has been sold/offered/no-saled. The pre-configured pause messages can be modified in the Admin website. When in pause mode, the clerk can still perform all clerking functions (previously, if the event was stopped, all clerking functions were disabled). This allows the clerk to fix any issue that may have happened without being subject to online bidders sending in bids. 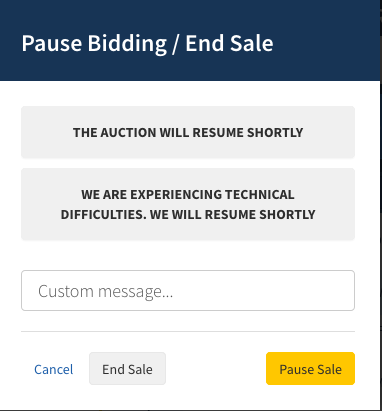 Online bidders will see the selected pause message on their side that lays over the bidding area. They will be unable to bid while the clerk is in pause mode. 6. End a sale - In an effort to improve the online user experience, Velocicast is adding the ability to more prominently announce the end of a sale to online users. Ending the sale happens when the user clicks ‘End Event’ and then chooses ‘End Sale’ in the ‘Pause Bidding / End Sale’ popup. Clicking ‘End Sale’ will cause a ‘SALE ENDED’ message to show on the clerk. The bidder will see a ‘SALE FINISHED’ message on their side that overlays the bidding area. Clicking ‘End Sale’ is not a destructive action, meaning it doesn’t kick off any processes, or remove items from a sale, or any other sort of action that would impede restarting the sale. In fact, a clerk can end and restart an auction as many times as they like without negative consequence to the overall sale. We strongly encourage all clerks to click ‘End Sale’ as each lane is completed. 7. Previous sold/offer/no-sale amounts are now hidden on reruns - When re-running an item, the previous sold/offer/no-sale amount will no longer show on the floor screens or online. The high money will now only show on the clerk screen. This will allow auctions to re-run items without influencing the second round of bids due to showing the previous run results. 8. Help Drawer - On the bidder screen, clicking the help icon now opens a panel we are calling the ‘help drawer’. The help drawer is populated with information associated with an individual auction. It can be customized in many ways, but will by default include the phone, address, and website of your auction. Until further notice, any customizations must be submitted to EDGE Support. Please contact EDGE Support to activate these features. 1. Language support - Simulcast now supports multiple languages on the clerk and bidder screens. If your auction is interested in providing a non-english language to your clerk and/or bidders, please contact EDGE Support to find out more. 2. Remove Online Bid Chime Setting - Removes the chime sound that is made when an online bid is received. Contact EDGE Support if you would like this setting turned on for your auction. 3. Lane-Level Default Bid Increment - The default bid increment can be set from the Velocicast Admin website or the clerk screen configuration settings. It will determine the starting bid increment for all items in a lane, if the need ever arises to change the default increment from $100 to another value. (NOTE: When an item becomes the ‘current item’ on the clerk, the starting bid type is recorded and saved for that item, so changing the default bid increment will only apply to items that have not yet been made the current item by the clerk). 4. Reports are Downloadable - You can download reports in .xls format to view, store and print. This is done by clicking the ‘XLS’ button at the top right of the screen in the reports area of the Velocicast Admin website. 5. Proxy (pre-bid) removal pop up on clerk screen - If an item has a proxy (pre-bid) and there is a change to the lights or announcements, it will trigger a pop-up on the clerk screen asking if they want to delete the proxy bids. On that pop-up, the clerk should only click ‘Delete’ if the light or announcement change negatively affects the vehicles value. (ex: adding an announcement of ‘Seller Guarantee’ would result in the clerk clicking ‘Cancel’ on the pop-up, since the change wasn’t a negative change). If your auction is interested in turning on this feature, please contact EDGE Support to request the addition. EDGE Simulcast (Velocicast) New Floor Screens! EDGE Simulcast Powered By Velocicast is pleased to announce the release of new floor screens today, all based on customer requests and feedback. We have added Multi-Lane displays for both Current and Next items. These are configurable based on lane number and photo visibility. Auctions may find it useful to shows these on a monitor in your lobby, cafeteria, etc. These screens are active today and will complement your existing floor screen configurations. Thank you and thank you for being part of the EDGE family! Hello auction friends! The EDGE Pipeline / Lookout team is excited to announce some new features that are live on the EDGE Admin site now! When it is the day of your sale / event, you'll now see this new button inside the "Events" management area in EDGE Admin. If your sale is finished for the day, you can use this new feature to take all un-sold vehicles that day and generate your "No Sale" list. (This was previously done automatically at midnight, now you can do it manually). This is particularly useful if your lanes are complete for the day and you'd like to list units for Buy Now / Make Offer immediately. However, please only do it once you're sure all lanes are done for the day, as this action cannot be reversed. This feature is live today, and free for all EDGE Pipeline / EDGE Lookout subscriber auctions. Dealer: "I can't get online, it says there was an error." You: "OK, like with your password on Pipeline?" Dealer: "No, I got an error trying to join the live sale." You: "Got it, OK. What's the error say?" Dealer: "I already closed it, I didn't read it." If you've ever been in this situation, the EDGE Pipeline team is excited to announce a new tool at your disposal. The new "Bidder Badge Requests" page shows a log of all attempts made to join your sale, if they succeeded or failed, and the reason why they failed. Clicking the "Failed" link will reveal the exact error text they were shown - in the example above this buyer is flagged as "No Buy" in the auction system. We hope you find this useful! This feature is live and free for all EDGE Pipeline / EDGE Lookout subscriber auctions.